Investigate the relationship between the Earth and Sun to gain an understanding of the energy that drives weather and the climate. Clearly narrated explanations, video clips, and vivid animations provide an interactive way to learn about our planet’s seasons, atmospheric composition, greenhouse effect, paths of solar radiation, and more. Students will learn the difference between weather and climate, the important roles of water vapor and carbon dioxide, how ocean currents influence temperature, and why the amount of solar energy received on Earth varies for different latitudes. 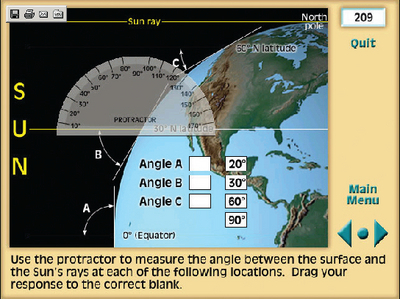 Review questions, lab activities, a visual index, and a glossary are also included.